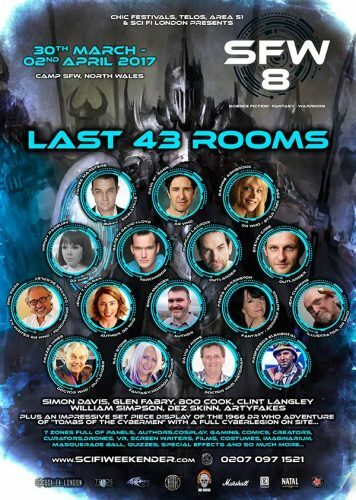 Sci-Fi Weekender (SFW for short) is Europe’s largest residential Science Fiction & Fantasy Festival. More of a festival than a con, SFW brings together the very best in sci-fi and fantasy. It is also an epic party. Next year’s SFW will be headlined by the Eighth Doctor himself, otherwise known as Paul McGann, from the Doctor Who TV Movie. Joining Paul and making a rare UK appearance will be Daphne Ashbrook, who played Dr Grace Holloway alongside Paul, as well as the title character in the Star Trek: Deep Space Nine episode ‘Melora’. Also announced is James Marsters, who – despite having a series of genre credits long than my arm – will be forever known as “the bad, rude man” Spike from Buffy: The Vampire Slayer. In the Author Zone will be Jenny T Colgan who wrote three of the BBC’s Doctor Who novels and the excellent Resistance is Futile. Alongside Jenny will be the award-winning Fantasy/Horror author Freda Warrington, who has written 21 novels, from epic fantasy to alternative history. Did I also mention it is an epic party? As SFW are going for a strong Doctor Who theme, there will be an impressive set-piece display of the Tombs of the Cybermen, from the iconic 1966 Patrick Troughton adventure. Cybermen, courtesy of the 15th CyberLegion, will also be at the event in force, keeping their cyber-eyes on proceedings. Expect also to see Daleks and other monsters patrolling the grounds. SFW is a sci-fi Festival-convention like no other, where like-minded people can gather to experience a diverse series of zones full of panels, authors, cosplay, gaming, comics, creators, drones, Virtual Reality, screen writers, films, costumes, an imaginarium, masquerade ball, special effects, stage sets, and much much more.